Indianapolis–Carmel–Anderson or Indianapolis metropolitan area is an 11-county metropolitan area in the U.S. state of Indiana, as defined by the Office of Management and Budget. The metropolitan area is situated in Central Indiana, within the American Midwest. 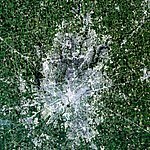 The metropolitan area is centered on the capital and most populous city of Indiana, Indianapolis. Indianapolis–Carmel–Anderson is the 34th most populous metropolitan area in the United States, and largest in the state of Indiana. As of 2014, the population was 1,971,274. Indianapolis also anchors the larger Indianapolis–Carmel–Muncie combined statistical area (CSA), the 26th most populated, with 2,372,570. The Indianapolis metropolitan area is part of the Great Lakes Megalopolis, which contains an estimated 59 million people. Map of the Indianapolis-Carmel-Muncie Combined Statistical Area. The Indianapolis-Carmel-Muncie CSA had an estimated population of 2,411,086 in 2017. The 317 area code covered all of northern and central Indiana until 1948, when the 219 area code was created. Central Indiana remained under the 317 banner until 1997, when growth in and around Indianapolis prompted the creation of 765 area code. The 317 area code covers the Indianapolis metropolitan area. The counties covered by 317 are Boone, Hancock, Hamilton, Hendricks, Johnson, Madison, Morgan, and Shelby. According to the Indiana Office of Utility Consumer Counselor, the 317 area code was expected to run out of numbers in 2017. Overlay area code 463 was implemented in late 2016, thereby requiring 10-digit dialing. Indiana's "Crossroads of America" moniker is largely attributed to the historical function of the Indianapolis metropolitan area has played as a center for logistics and transportation. I-65 – Runs to Gary, Indiana to the north and Louisville, Kentucky, Nashville, Tennessee, and Birmingham, Alabama to the south. I-70 – Runs to Columbus, Ohio, to the east and St. Louis, Missouri, Kansas City and Denver, Colorado to the west. I-74 – Runs to Cincinnati, Ohio to the east and Peoria, Illinois, to the west. I-465 – Also known as the USS Indianapolis Memorial Highway, I-465 is a beltway circling suburban Indianapolis. I-865 – It is an east–west connector northwest of Indianapolis in Boone County. Indiana Avenue (Indianapolis) – One of four diagonal streets included in Alexander Ralston's 1821 Plat of Indianapolis, the street became a center for the local African American community and now anchors a cultural district of the same name. Meridian Street (Indianapolis) – A primary north-south route through Marion and Hamilton counties, the street serves as the axis separating east addresses from west addresses. Michigan Road – Indiana's first "highway," built in the 1830s and 1840s, running north to Michigan City, Indiana and south to Madison, Indiana. Sam Jones Expressway (Indianapolis) – Expressway between I-465 and I-70, connecting south-central Indianapolis with the former terminal of the Indianapolis International Airport. Washington Street (Indianapolis) – A primary east–west street through Marion County, the street follows the route of the National Road for almost all of its length in the city of Indianapolis. The Indianapolis metropolitan area is served by several airports, most under ownership and operation of the Indianapolis Airport Authority, including Eagle Creek Airpark (EYE), Indianapolis Metropolitan Airport (UMP), Indianapolis Regional Airport (MQJ), Hendricks County Airport (2R2), Indianapolis Downtown Heliport (8A4), and the busiest airport in the state, Indianapolis International Airport (IND). In 2014, Indianapolis International served 7.4 million passengers and handled nearly 1 million metric tonnes of cargo. Indianapolis Union Station serves as a hub for Amtrak, which maintains service to the Cardinal and is the eastern terminus of the Hoosier State. The ‡ symbol denotes university branches whose main campuses are located outside the Indianapolis metropolitan area. Headquartered in Indianapolis, the National Collegiate Athletic Association (NCAA) is the preeminent collegiate athletic governing body in the U.S. and Canada, regulating athletes of 1,281 institutions; conferences; organizations; and individuals. The NCAA also organizes the athletic programs of many colleges and universities and helps more than 450,000 college student-athletes who compete annually in college sports. 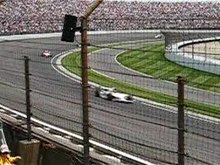 The Indianapolis metropolitan area hosts several notable sporting events annually, including the Brickyard 400, Grand Prix of Indianapolis, NHRA U.S. Nationals, NFL Scouting Combine, Big Ten Football Championship Game, the largest half marathon in the U.S., and the largest single-day sporting event in the world, the Indianapolis 500. The cars competing in the latter race are known as IndyCars as a reference to the event. Indianapolis has also been a frequent host of the NCAA Division I Men's and Women's basketball tournaments. Other major sporting events hosted include Pan American Games X in 1987, Super Bowl XLVI in 2012, and the 2013 International Champions Cup between Chelsea F.C. and Inter Milan. High school sports are highly competitive in Greater Indianapolis. In 2013, MaxPreps ranked Indianapolis No. 3 in its Top 10 Metro Areas for High School Football. ^ "InDepth Profile: STATS Indiana". www.stats.indiana.edu. Retrieved June 17, 2018. ^ "NANPA : Number Resources - NPA (Area) Codes". Nanpa.com. Retrieved 21 December 2014. ^ Russell, John. "New area code, mandatory 10-digit dialing, come to Central Indiana". Indianapolis Star. Retrieved July 4, 2016. ^ "OneAmerica 500 Festival Mini Marathon & 5K". halfmarathons.net. Retrieved 2015-05-26. ^ "Indianapolis beats out Houston, Arizona to host first Super Bowl". NFL.com. Retrieved 21 December 2014. ^ "Indianapolis Sports - Indianapolis Star - indystar.com". Indianapolis Star. Retrieved 21 December 2014. ^ "Top 10 Metro Areas for high school football in 2013". MaxPreps.com. Retrieved 21 December 2014. This page was last edited on 11 March 2019, at 20:34 (UTC).